Published June 16, 2014 By Anna T. This post may contain affiliate links. Regardless, I only recommend sites I've researched and/or used and trust. Working from home is much more commonplace nowadays than it was ten years ago. When I first started researching work at home job opportunities (probably about ten years ago), I had a lot of trouble finding anything through a basic Google search that didn't lead me straight toward a scammy-looking website. Thank goodness that's no longer true! Even so, many people still feel uneasy about the idea of working from home and worry that they may be taken in by a scam every time they apply for an online position — especially if it's a company they've never heard of before. So, I decided to create a list of 20 well-known companies that hire remote workers. 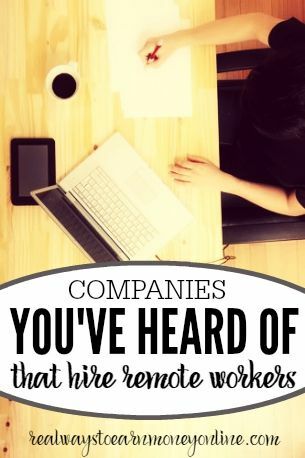 These are companies that you and probably everyone else have heard of, but you may not have realized they offer work from home positions! Amazon – Read Amazon Work at Home Jobs Review – I think we all know about Amazon! And yes, they regularly hire home-based workers to handle their customer support. Most of the time these jobs are limited to people in specific states. You can do a search for “work from home” on their Careers page to see if they need home-based workers. American Airlines – This major airline occasionally hires work from home reservation reps. These are location-specific because the company requires that you train onsite prior to working from home. They are not always hiring. You will have to do a search on their Careers page for work from home jobs to see if they are. American Express – Read American Express Work at Home Review – This company almost always has various home-based positions available in customer service and also travel. Apple – Read Apple Work at Home Review – Usually has home-based customer support and chat (non-phone) positions available. Best Buy – They have occasional openings for work at home chat agents to provide tech support. Requires some experience in providing support for mobile apps, Apple, and Microsoft products. Blooms Today – Read Blooms Today Work at Home Review – A popular flower company that hires seasonal workers to help with flower orders. Capital One – Read Capital One Work at Home Jobs Review – They hire work from home customer support agents. You usually have to live in a certain state so you can come in for training first (I often see them recruiting in Virginia and Florida). Carnival – Read Carnival Work at Home Jobs Review – This major vacation/cruise company usually has virtual job openings. You can work as a virtual vacation planner or a remote sales agent. Use the keywords “virtual” or “work from home” in their job search box to find the remote openings. Discover – Has work from home customer service jobs available as part of their military outreach program. You must be near the Dover, DE Air Force Base to qualify. Enterprise Rent-a-Car – Read Review – Always hiring work from home reservation agents. Like many of these jobs, you may have to live in or near a specific city, but they have openings in lots of cities nationwide. Hilton – Read Hilton Work at Home Jobs Review – This major hotel company has frequent openings for work at home reservation agents, customer care coordinators, and also guest experience specialists. You may need to be local to Dallas, TX or Tampa, FL to qualify for these positions as they require onsite training prior to you working from home. Home Shopping Network – Read Home Shopping Network Jobs Review – You can work from home for HSN doing customer support. It's location specific — they are often hiring in TN, VA, and FL. Intuit – Read Intuit Work at Home Jobs Review – The creators of the popular Quick Books and Turbo Tax software occasionally has home-based seasonal tax advisor positions available. Under the “Select Location” tab, be sure to pick “USA Remote” as your option to see just the home-based jobs. Neiman-Marcus – Read Neiman-Marcus Jobs Review – They hire work from home customer support agents. This is another one that is usually location-based. The most recent home-based job openings for Neiman-Marcus have been for people in Texas. Search here and select the option for “Work From Home” within the Job Field drop down box to see only the remote openings. Note they are not always hiring. Nordstrom – Has occasional openings for work from home customer service reps. Search “work from home” on their jobs page to see if they have it listed. Stitch Fix – Read Stitch Fix Stylist Review – This is a well-known subscription box company that uses work at home stylists to help curate the boxes they send out to their clients. Hiring in many, but not all, major cities nationwide. Teleflora – Read Teleflora Work at Home Jobs Review – This is another popular flower company with seasonal customer service openings. U-Haul – Read U-Haul Work at Home Jobs Review – You can work at home for U-Haul doing everything from social media to roadside assistance. They almost always have a few home home-based positions available. Verizon – They frequently have work at home customer service rep positions open. Note that these are usually location-based and will require that you travel to an office in your area to train before you work at home. Williams-Sonoma – Read Williams-Sonoma Work at Home Review – They regularly hire seasonal work from home customer service reps, paying $11 hourly. Requires on-site training in The Colony, TX. Xerox – Read Xerox Work at Home Jobs Review – Xerox frequently has several work from home positions available. I've seen jobs in the medical/insurance field posted as well as data entry positions. You have to visit their jobs page and search “work from home” in quotations to see what is available at any given time since it changes. You'll notice that many of these positions are phone jobs and are also location-based. If you're specifically looking for non-phone work, you can check out my non-phone resource page here to get pointed in the right direction. Looking For More Reputable Companies Hiring Home-Based Workers? If so, I recommend getting a membership at FlexJobs. I have signed up here, thoroughly checked it out, and approve of their service. They post a large number of flexible and work at home job leads 5-6 days per week, and they promise no scams will be posted. They will not even accept submissions from businesses that don't have brick and mortar locations. Many, many reputable companies that you've likely heard of advertise their home-based openings there. It's $14.95 a month, but you can set your account up so it doesn't bill you for the next month if you just want to try it out and see if you think it's worth it. You can go here to check out FlexJobs. Be sure to use promo code AFFILPROMO to get 30 percent off the already small fee. Unemployed eight months would like work at home (non phone) to start immediately earning atleast $20 per hour. Anyone have any ideas??? I seriously want to know why South Carolina has practically nothing to offer working from home from companies? Does anyone have an answer to this question? I’m confused as to why Nordstrom has listed (for their ‘At Home’ department) that “light cleaning” is one of the maintenance tasks required, when it’s supposed to be a work at home job. I am guessing that these companies are probably hiring for customer service. One reason in particular is because with the new health care law, most companies have downsized to just hiring part-time workers. They will not have to provide a telephone, computer or desk. This does not surprise me at all. For the person who is looking for part-time work, this is a good opportunity. You are guessing wrong. Many “work at home” jobs hire FULLTIME employees. I have worked for such a company since February 2010. My company provides health benefits, a choice of traditional or Roth 40lk and PTO. My particular department is changing so I am exploring options. To assume “work at home” jobs are sub par would be to assume all ‘traditional’ jobs are well-paying, benefit-filled places of nirvana. Awesome list, Anna! Isn’t it amazing how many well-known companies are now coming on board the “Work-at-Home Train”? I’d love to see even more. Wow great list! It’s awesome how many big companies offer work from home jobs. It legitimizes this way of working. Awesome! Thanks so much for this. I’ll be passing it along too.